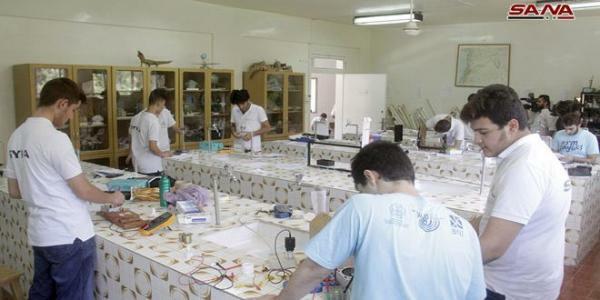 The National Commission for the Syrian Science Olympiad on Thursday concluded activities of the preparatory scientific assembly for the Syrian national teams in math, chemistry, physics, IT and biology, in preparation for an upcoming participation in international Olympiads. The Assembly kicked off in June at the Martyrs Daughters’ School, with the participation of 141 students of the Syrian Science Olympiad from various provinces, including the student of the first, the second and third secondary school grades. 23 students from the Syrian teams passed the final exam in the assembly and they will participate in the international Olympiads competitions, according to the head of the Syrian Scientific Olympiad, Ali Abu Khider. A number of the students participating in the assembly said that it is an opportunity to acquire new scientific and theoretical skills and measure the development of each student through the final test. The international Olympiads will be launched in July, in which the math Olympiad will be held in Romania, the IT in Japan, the Physics in Portugal, the Chemistry in the Czech Republic, and Biology in Iran.